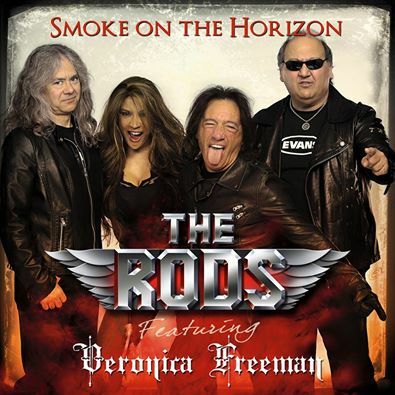 American 80’s heavy metal power trio THE RODS have announced the release of their brand new single “Smoke on the Horizon”, featuring BENEDICTUM vocalist Veronica Freeman “The V”. “Smoke on the Horizon” will be available for purchase worldwide via itunes and all digital media outlets on May 14, 2015. (Guitarist David “Rock” Feinstein) – Garry had let Carl and I know that he had made friends with Veronica some months ago. After a while he began playing her recordings for us, and we knew after hearing them, that she had a very good voice. Her original music is very good, but quite different than the traditional RODS style, and her voice is powerful with a true “Heavy Metal” edge to it. Soon Garry suggested that maybe she could come and sit in with us to sing a couple of songs. She had already been doing some DIO covers, so we thought that would be a perfect fit. We have a great time playing the DIO songs, and Veronica does an excellent job of singing them. A guest performer is something different for us, but so far it has been great fun, and I think the fans will really love it. (Drummer / Producer – Carl Canedy) – Veronica Freeman has a truly powerful voice! After a killer warm-up show with her in Auburn, NY, it struck me that it would be a shame to not document this merging of talents with a studio recording. David’s song, Smoke on the Horizon, seemed like a perfect fit. We were able to record this song very quickly during Veronica’s visit and I think the fans will be surprised and pleased with the outcome. The “V” will also be joining The Rods for their European dates performing a set of Classic Dio and Black Sabbath songs. (Bassist Garry Bordonaro) – I met Veronica “The V” Freeman through friends, musical connections. During a trip to Phoenix to visit family, I asked her to meet me at a Y&T show. Unfortunately, because of some communication snafus (my fault), she went to the show and I didn’t. The exchanges following that regrettable incident convinced me that she and I had a lot to talk about. On later visits we did meet and spent some time together, and had a lot of good times. We have a real friendship, and have often talked about working together on a project. After hearing early mixes of her new album, it was clear that she deserved exposure to a wider audience. We discussed having her come with us on our European dates, and Carl and Rock agreed to bring her along. We thought it would be fun working with her, and to have a female singer in front of the band, something we have not done before. We decided to play Dio songs because we all know and enjoy playing them, and really didn’t have time to work up her new material. We also put together a quick recording session for a new version of Rock’s song “Smoke On The Horizon” to document this collaboration and get her on the news pages. I think Rods fans and Benedictum fans will have a blast seeing her perform with us, and will really like her new material when it’s released this summer. At least we are going to have a lot of fun doing it! (Vocalist Veronica Freeman “The V”) – After having met Garry in person I knew I had a friend for life! We clicked on a lot of levels. I felt comfortable enough to share some of the solo material with him and was blown away by his reaction. The series of events that followed have been exciting and rather unbelievable for me. Next thing you know I am meeting the entire band for the first time, doing photo shoots and then bam, in the studio to record “Smoke on the Horizon” then a show and soon we head out for some shows in Europe! It was like a mini whirlwind and I survived it lol.Now we go to Europe and I am beyond excited. The guys are great and things just seem to be falling into place. I love it! The Rods will feature a guest performance from BENEDICTUM vocalist Veronica Freeman, (“The V”) during selective upcoming European shows. European shows featuring “The V”. The Rods will be on the road promoting their latest single as well as performing classic songs from their entire album catalog. For the latest news, visit both The Rods and Benedictum official websites.